HALIFAX -- A fire that has been burning for a week aboard a container ship off Canada's east coast is now said to be "largely contained" and under control. 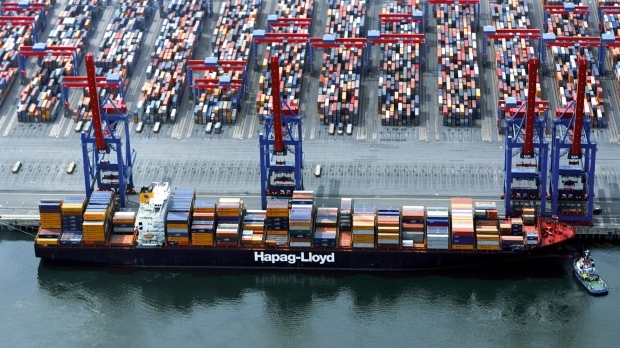 The German shipping company Hapag-Lloyd says five crew members were transferred back to the Yantian Express on Wednesday evening from one of the massive tugs fighting the fire. It says the ship is 1,400 kilometres off the Canadian coast and is being slowly towed to port. After the fire spread to other containers, the ship was evacuated and two ocean-going tugs were dispatched to fight the blaze. Hapag-Lloyd says a third tug is en route to the Yantian Express to assist, and is expected to arrive on Sunday. The company says it is unable to estimate damage to the ship or its cargo.